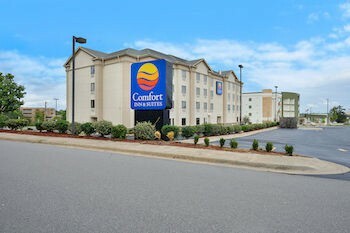 The hotel is conveniently located with easy access to many nearby landmarks and attractions. It is close to the Arkansas State Capitol Building, the William J. Clinton Presidential Library and Museum, Verizon Arena and the Little Rock Zoo. The University of Arkansas at Little Rock is just minutes away.FacilitiesThe establishment comprises a total of 70 accommodation units. Services and facilities at the hotel include a laundry and coin-operated laundry. Guests can use the parking spaces if required.RoomsAll accommodation units feature air conditioning and central heating. In addition, a fridge, a microwave and tea and coffee making equipment are available. An ironing set is also available to guests. Each accommodation unit offers internet access, a telephone, a TV and wireless internet access. A hairdryer can also be found in each of the bathrooms.Sports/EntertainmentGuests have plenty of recreational options, with a range of sport and leisure opportunities. The establishment offers an indoor pool. A hot tub provides an opportunity for relaxation. Leisure options available to guests include a gym. MealsBreakfast is bookable as a board option.PaymentThe following credit cards are accepted at the establishment: American Express, VISA and MasterCard.